Haunted house attractions in Japan are more immersive and intimate than in America. 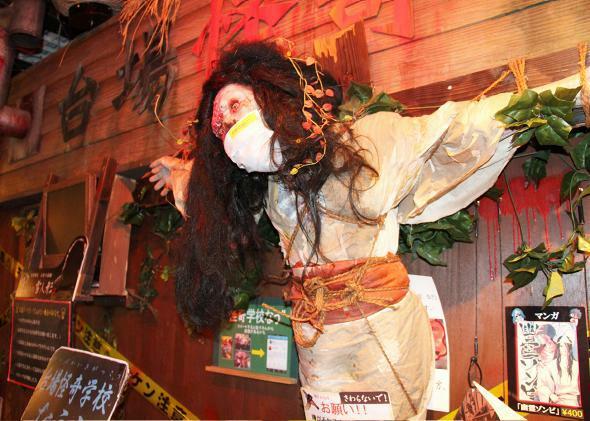 Japanese haunted house attractions construct an intimate, immersive experience that will actually thrill you. 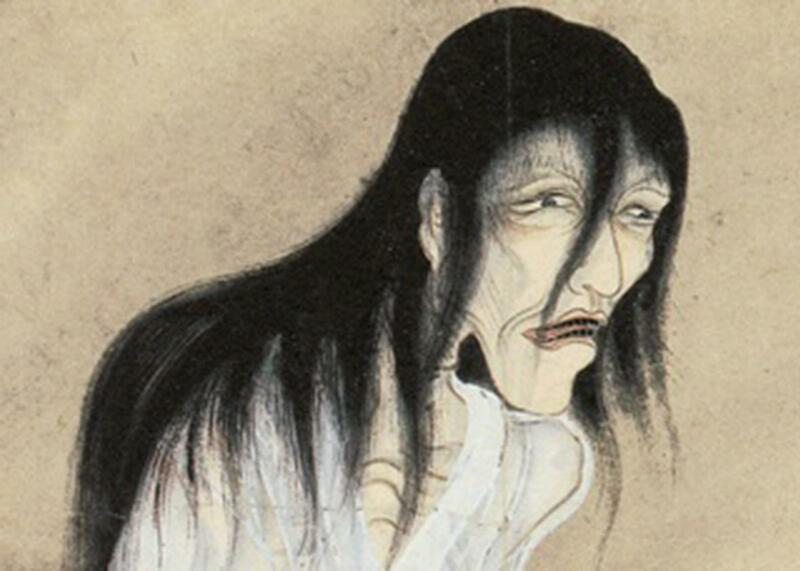 A yurei, or Japanese ghost, from the Hyakkai-Zukan. Excerpted from Scream: Chilling Adventures in the Science of Fear by Margee Kerr. Out now from PublicAffairs. The Decks at Tokyo Beach is part of a massive beach entertainment complex. I wandered around the multilevel entertainment complex and shopping mall in a total daze. As a stranger in a strange land, I hadn’t had an extended conversation with anyone (except myself) in a week and had averaged about four hours of sleep a night. I honestly thought I was hallucinating when, in my wanderings past stores like Happy Smile Playland and LOL Picture Shop, I came across a dangling crucified corpse, wearing long black hair and a surgical mask and surrounded by red lights, cobwebs, caution tape, vines, and random severed body parts. I stood staring at the façade behind it: a haunted house called the Daiba School. It was designed to look like the front of an old schoolhouse, complete with wooden shingles and rusty pipes covered in blood (on the other side of which was, unaccountably, a fluorescent pink electric pine tree). My bewilderment must have been obvious. The cashier started speaking to me in a very friendly and energetic voice. I walked over, smiled, held up my hands to the side, and made an “I only speak English” face that I’d perfected during my trip. She laughed, disappeared for a few minutes, and then came back with a calculator to show me how much admission was—800 yen, or about $8—and made a welcoming, sweeping motion with her hand. From there she walked me around the schoolhouse to the entrance, pointed to a spot right in front of a black drape, and left. Entrance to the Daiba Strange School. Most Japanese horror is heavily based on ghost lore. Every haunted house I had been to in Japan required me to read or view an extensive setup to understand the backstory. At the Haunted Hospital, I had to sit and watch a video describing the bad deaths that had occurred there and the evil they’d left behind. Each haunted house is built around a story of a violent death or a troubled and abusive relationship that has contaminated the space, leaving it haunted with Yurei (ghosts of those suffering bad deaths) who will torture anyone who enters. I didn’t see any witches, ax murderers, or chainsaw-wielding maniacs covered in blood and gore, all of which are normal and expected in the United States. Japanese haunts are also darker, mustier, and tarnished—perhaps more creepy than gory. The story he told me to read was about students, including a young girl (the Snow Doll) who had been caged and tortured by an evil old woman and a young boy who had hanged himself in the school. The school, cursed from the bad deaths, is now haunted by an evil and malicious ghost, and it would be my job to go in and vanquish the evil spirit and save the caged and abused schoolgirl. My task would not be a simple one; I would likely confront the evil ghost, and I had to be brave. I would be given tools to help me: a light to guide my way and an Ofuda, which is a paper talisman with holy Shinto text that would banish the evil spirit. I would have to find the fire inside the schoolhouse, recite the sacred text from the Ofuda, and then throw it into the fire, banishing the evil ghost and freeing the schoolgirl. I got chills just reading the story. He handed me my flashlight and the small thin paper Ofuda. He took me to the entrance and pointed to the word on the piece of paper and said it out loud, then pointed to me, and I repeated it. He shook his head and shouted the word louder, I did the same, and then we both repeated it two more times, each time louder than the last. With my heart pumping faster, I gripped my flashlight and held the Ofuda in front of me. I felt a surge of adrenaline. He smiled and pulled back the curtain. It was time to be a hero. In all my years as a thrill-seeker, I had never had a monster run straight at me in a haunted house. This isn’t just a coincidence; haunted house actors usually do not charge full speed at customers from the front because it makes them back up (which creates crowd traffic) and sometimes act out in violence (people punch). For these reasons, it’s more lucrative in America to “scare people forward.” But no such rules were in play at Daiba. A ghost came charging at me, and I lost my freaking mind. The evil ghost stopped abruptly not 2 inches from my nose. She was a good 7 or 8 inches taller than me, and from behind her hair I heard her breathing in a low, growling manner. I was whimpering, truly terrified, and shaking. Then, just as quickly as she charged at me, she was gone, her white robes flowing behind her, dissolving back into the ghostly dark. The encounter couldn’t have lasted longer than 20 seconds, but it felt like forever. I stood up straight and again scanned the hallway in front of me. I had to force myself to keep going, but I made it all the way down to the end and then had to turn a blind corner. I held my breath anticipating another encounter with an evil ghost, but no one was there. As I began to relax again, the wicked ghost reappeared, this time from the side. She growled in my face, then quickly took off, perhaps through a hidden door. I screamed again, my fear feeling more genuine than ever before. I was being stalked by a ghost in my own personal haunted house. Still, I had my mission. I had to look for a fire to save the little girl. I shined my flashlight all around the long, dark hallway; the walls were distressed, as though they had been beaten with a sledgehammer, and starting at waist level there were frosted windows, some with bloody handprints. Rooms were littered with various schoolhouse furniture; chairs, desks, and pencil boxes were strewn about the floor. Dark shapes passed by the windows, casting shadows, only to pop out later from behind the next door. Finally I turned a corner and saw a glowing and flickering light. It had to be the fire. A loud, low thundering sound filled the hallway as I began making my way toward the light, and it surrounded me and got louder as I approached the flames. Then there was a sudden percussive bang—I jumped and turned around. The ghost was back, her face lit by the fire behind me, charging at me from behind, screaming and howling with her hands in the air. I sprinted away, like an animal. She chased me down the hall toward the fire. I shouted the sacred text and threw the Ofuda into the flames. In an instant the evil ghost disappeared, and the thundering stopped. I was breathless as I walked the last few steps out of the haunt, passing a sign in Japanese that I assume said something about saving the abused girl and vanquishing the ghost. The young man and the cashier were both waiting for me at the exit with smiles on their faces, and they weren’t the only ones. My screams must have been pretty loud, as groups of people had come over from the arcade to see what was going on. I clapped my hands as I walked out and said it was wonderful and bowed my head in thanks. I screamed more in that tiny haunt than I did walking through some of the top haunts in the United States with every high-priced animatronic and 20-foot-tall monster available. I believe the key difference was how immersed I was in the story and the personal connection I felt with the girl and the ghost. Japanese culture is traditionally more future-oriented and values the investment of time and energy into telling a story, knowing it will pay off down the road. Including the guests in a plot to save someone else also reflects a more collectivist perspective—it’s not about getting through yourself and surviving but about being a hero. By the time the first startle was triggered I was so engrossed in the story and the scene that nothing could have pulled me out of the moment. I was part of the experience, not just a passive viewer. You don’t need a haunt with 200 actors all playing different monsters to scare the crap out of you. All it takes is one ghost, out to find you wherever you go. Excerpted from Scream: Chilling Adventures in the Science of Fear by Margee Kerr. Reprinted with permission from PublicAffairs.